GT Transeo Review: One of the best versatile bikes. 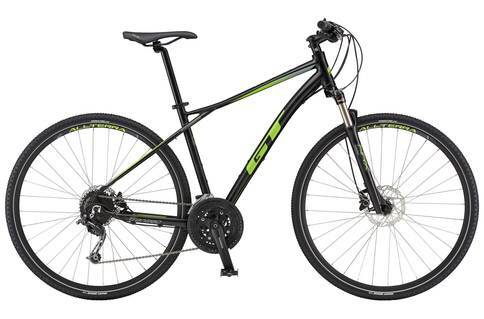 If you are looking for a decent, all-purpose entry-level hybrid bike for some basic commuting or fitness fun, then you may find something you’ll like in the GT Transeo series. These bikes come with some basic but purposeful specs, with mostly Shimano and GT’s own componentry. The GT Transeo hybrids certainly look good, with some pretty good women-specific models around as well. We tried some of these models out both on and off road to see how they would handle, and we were pretty happy with the results overall. We were pleased with the combination of Shimano, GT, and Tektro parts on some of the models, with the best performance coming from the top of the line bikes. The Transeo bikes are quite versatile, based on the few rides we took around the city and through some hilly spots as well. These hybrids are not bad at all off road, and seem quite durable with their light, aluminum and alloy frames. Some of our reviewers felt that the saddles were not too comfy, but they may just take some getting used to. Climbing and acceleration were breezy, with some excellent gearing options with the Shimano drivetrains. You can find panniers and mudguards too, so these will have good functionality for commuters. At this price range, you may be getting a bargain. For a budget bike, these hybrids perform their duties without any major trouble, and are best suited for commuting and off road leisure riding. Upon review, we would definitely recommend a GT Transeo bike for urban riders and low budgets. While we have come across some better options from GT at this price range, the Transeo bikes perform well enough for basic needs.